A day devoted to high school students of all ages who play a brass instrument including trumpet, horn, trombone, euphonium and tuba who are interested in learning more about how to perform the prescribed audition etudes for all-region and all-state band for both TMEA and ATSSB. There will also be information for prospective music majors about the School of Music and its audition requirements for acceptance. All clinics including the SFA Faculty Brass Performance are free of charge! The 4 p.m. concert is free with pre-registration before November 6 (below). Regular ticket prices are $8 for adults, $6 for seniors and $3 for students. noon-5 p.m. Showcase Saturday for prospective SFA students who wish to find out more about the campus and take a tour. No reservation needed; meet at the Baker Pattillo Student Center. Number of Free Student Tickets Needed for Center Stage Brass Concert at 4 p.m. Chaperones may also be included in this number. Please be accurate. Finishing off a great two weeks of SFA Summer Band Camps. It’s always rewarding to see the kids improve through their time here and even better when they return year after year building on what they learned last year. Now for a few weeks of rest before summer 2 session starts! Excited to join The Four Horsemen Tuba Euphonium-Quartet! Our debut performance was at the 2018 Midwest Regional Tuba-Euphonium Conference in Ft. Wayne, IN. Plenty of cool performances and recordings coming. You can check it out online at http://www.music.sfasu.edu/stream.php . Hope to see you all there or online! 2014 School Year has begun!! Another summer has come and gone. 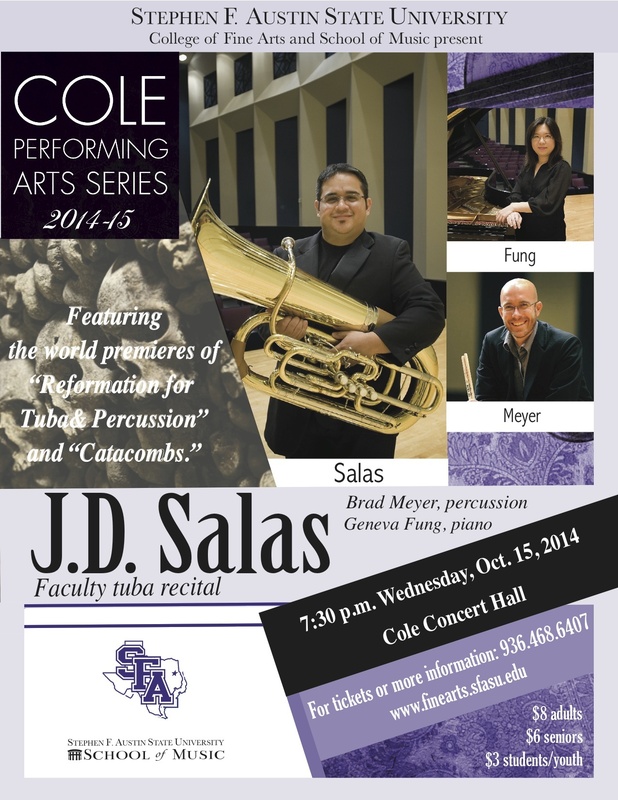 It looks to be a great year for the SFA Tuba-Euphonium Studio. I’d also like to give a special welcome to Mr. Ronnie Ross, our new Adjunct Professor of Tuba-Euphonium. Ronnie will be helping out the studio as we grow.